Are you confused in choosing between Canon XA30 and Canon XF100? As for the moment, the two models are available at almost similar prices. However, they do offer different specifications and features. As the effect, depending on your personal needs and preferences, you may prefer one over the other. So, what are the differences between Canon XA30 and Canon XF100? Let us see below! Quite interestingly, Canon XA30 comes with a slightly better image sensor compared to Canon XF100. Whereas Canon XF100 relies on a 2.37 MP Canon Native 1920 x 1080 CMOS image sensor, which actually performs an excellent job in capturing sharp and detailed images, Canon XA30 boasts a 3.09 MP Advanced HD CMOS Pro image sensor that offers decent crisp and clarity. The sensor area has also been widened, allowing for improved color depth and dynamic range. The low-light performance is most noticeably enhanced, featuring refined low-luminance noise rating of +3 dB. However, you need to take a note as well that Canon XA30 can only record in a maximum bitrate of 35 Mbps (for 1920 x 1080 Full HD, 60p). Compare it to Canon XF100 that boasts a maximum digital quality of 50 Mbps for similar resolution and frame rate. A higher bitrate means that there are more data that can be stored in each second of the digital file. So, in general, Canon XF100 is actually able to deliver better recording quality than Canon XA30. Another thing that we need to consider in choosing the right camcorder is, of course, the maximum zooming power. Quite interestingly, Canon XA30 and Canon XF100 come with lenses of the same series, Genuine Canon HD Zoom. However, Canon XA30’s lens is more powerful than Canon XF100’s lens. While Canon XF100 can only provide a maximum zooming power of 10X, Canon XA30 offers up to 20X optical zoom. This advantage comes in handy when you need to record footage from a distance, such as for recording a football match. Another crucial difference between Canon XA30 and Canon XF100 is the battery life. Canon XF100 only has a maximum runtime of 105 minutes, whilst Canon XA30 is able to work non-stop for up to 2 hours 55 minutes. The other features of the two models are more-or-less similar. In general, Canon XA30 makes the best way to go. The zooming power and battery life are better. 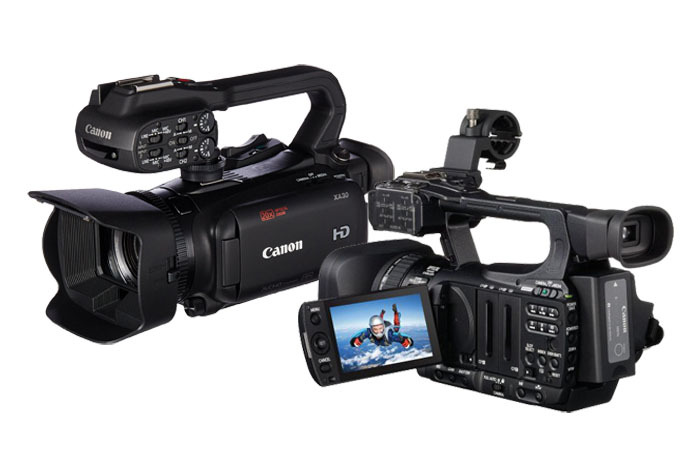 However, for professional purposes, you may need to choose Canon XF100 instead, which offers 50 Mbps recording quality.